Love Waterfall, located about 4km to the North-West of Sa Pa Town in San Sa Ho Commune, Sa Pa District, Lao Cai Province. From far sight, the waterfall looks like a twinkling pyramid under the sun. 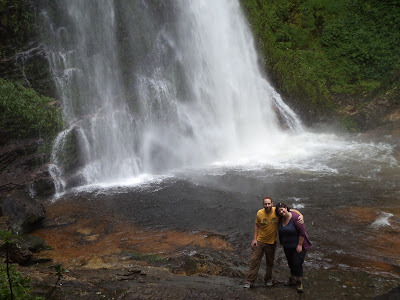 In order to go to the Love Waterfall, visitors have to go on a red dirt road running through the lush and vast bamboo forest and gentle beauty of rhododendron flowers with the diversity of colors such as red, white, yellow, which creates the particular scenery here. Along with this, you will hear the soothing sound of the rustling of trees in the wind and birdsongs. In the end of this road, tourists will meet a stream named Gold Stream; continue to walking along the stream bank, we reach the Love Waterfalls. It is such a poetic picture. And if you visit Love Waterfall in foggy days, it is lucky for you. Visitors can witness the beautiful views as in paradise. In this time, mist covers entire surface of the stream, crept into the canopy of trees, waterfall appear in both virtual and real way. According to the local people, the name of the waterfall originates from a love story between O Qui Ho and a seventh fairy. Legend has it that long ago, fairies from heaven used to come to this waterfall to bath because this water is very cool and clean. One day, the seventh fairy saw O Qui Ho, the first son of Ai Lao Mountain Genie who was playing his flute near the falls. Mesmerized by the flute sounds, the fairy spent every night listening to the sweet melodies and forget about time to comeback heaven. O Qui Ho has demonstrated to her the most wonderful music. They fall in love to each other after so many times like that. And until her parents detected her secret and forbade her from coming back to the Waterfall. Because she missed O Qui Ho so much that she spent every afternoon at heaven’s gate looking towards the waterfall and waiting for the sounds of the flute. But she is unable to hear and see him, so she was so sad. Then, the fairy turned into gold bird flying around the mountain calling 3 sounds O Quy Ho, as a result, she could live together with her love forever on O Qui Ho Mountain. 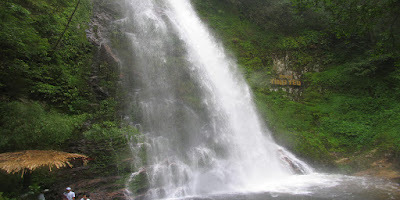 That is the reason why they call this waterfall with name Love Waterfall, and call the pass nearby is O Quy Ho Pass. Nowadays, Love Waterfalls is an attractive place where tourists must visit in Sapa tour. It is also an ideal destination for romantic honey moon vacation of many happy couples.